In markets around the world, we’ve seen rising anxiety about economic inequality. This makes it especially important to provide new entry points for job seekers of all skill levels, as well as opportunities for advancement from day one on the job. We believe that Walmart is uniquely situated to provide this kind of opportunity. As a global retailer, we’re well positioned to promote the role retail can play in economic mobility, provide training and job experience to new members of the workforce, and encourage suppliers do the same. Our goal is to increase economic mobility for workers, whether they work in a Walmart or other retail store, a factory or a family farm. As in so many other areas, we’ve learned that to maximize our impact we need to think in terms of the entire system. To provide meaningful opportunity, it is not enough to simply address onboarding or training. We must strive to identify and reduce system-wide barriers and to give workers the tools they need to advance within our stores, within the sector, or even in other parts of the economy. 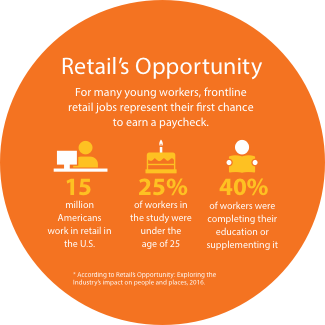 We truly believe that retail can impart skills and accelerate progress for workers everywhere. To achieve these goals, we collaborate with a broad array of stakeholders, including associates, employers, educational experts, nonprofit organizations, technology companies and governmental agencies. We see value in this approach for both society and our business: We hope to improve the economic mobility and inclusion of millions of people while also strengthening the talent pool our business relies on. Walmart is a company where it’s still possible to start with a job stocking store shelves and build a career with unlimited opportunity. Our CEO, Doug McMillon, for example, began his career in a Walmart warehouse. Three quarters of our U.S. store management teams began as hourly employees. 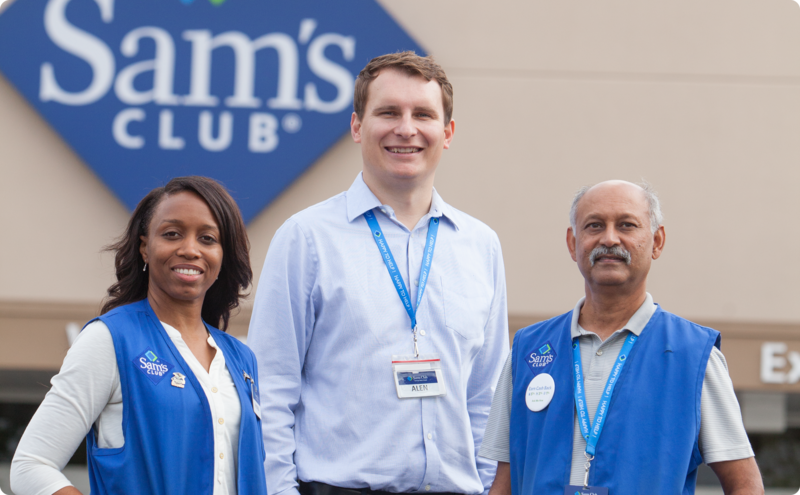 In the U.S., where approximately 90 percent of the population lives within 10 miles of a Walmart store or Sam’s Club, we believe that we can be a source for advancement in thousands of communities. Providing that sort of opportunity is more important than ever. According to a study from Programme for the International Assessment of Adult Competencies, lower-skilled workers make up a significant part of the U.S. adult workforce. Meanwhile, job opportunities for lower skilled workers have decreased. With an average 300 positions in each of our U.S. supercenter stores, Walmart can provide a broad opportunity for workers to learn important—and transferable—job skills while earning a paycheck. To help enable that advancement, we provide our associates with both stability and mobility. We firmly believe both are required for a fulfilling career experience. That means that we support our associates in the jobs they have while striving to provide the tools they need to advance. We see each job as a pathway to greater opportunity, whether it’s within Walmart, within the sector or in another industry entirely. Wage increase. To help meet our commitment of providing stability, we maintained our U.S. entry-level wage of $9 per hour for new hires, with an additional increase to at least $10 per hour after successfully completing our Pathways training program, which associates can finish in as quickly as 90 days (as of 1/23/17). We also raised the wages of all U.S. hourly associates hired before Jan. 1, 2016, to at least $10 per hour. Scheduling. Handling responsibilities at home can be difficult with an ever-changing schedule. When our associates have more stability at work, they have a greater ability to address demands outside of work and pursue training and education opportunities needed for greater mobility. Our associates get their schedules more than two weeks in advance, and in FY2017 we began piloting a new scheduling format to provide associates with more consistency, flexibility and control over their schedules. Some associates have fixed schedules, enabling them to work the same hours on the same days for a more consistent schedule— and more predictable paycheck—while others have the option to build their schedule (even pick up additional, unfilled shifts) each week, based on changing needs. The new scheduling format began testing in Neighborhood Markets in FY2017, and will be tested in other formats in FY2018. Short-term disability. Stability also means being able to weather illnesses or injuries that require time for recovery. That’s why Walmart added a basic short-term disability plan at no cost to full-time hourly U.S. associates in FY2017. It pays 50 percent of an associate’s average weekly wage, up to $200, for up to 26 weeks. We also added an enhanced plan at a lower cost than our previous voluntary plan that provides up tπo 60 percent of an associate’s average weekly wage for up to 26 weeks. Quarterly bonuses. Eligible associates will continue to qualify for quarterly bonuses based on the performance of their store. In FY2017, hourly associates (full-time and part-time) received more than $700 million in quarterly bonuses. Providing a ladder of opportunity is part of our investment in our associates. While Walmart has long been a place where frontline workers could advance in the organization, we want to make that upward progress easier and faster, helping enable more associates to reach positions of greater responsibility and income, both within Walmart and beyond. Training for new workers. In FY2017, we introduced Pathways, our new training program for U.S. entry-level associates. 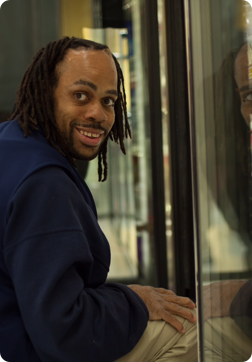 Pathways helps associates gain vital retail job skills and may be completed in as quickly as 90 days. Our goal is to better integrate new hires into Walmart’s culture, reinforcing our core values and our focus on serving the customer. Pathways teaches valuable and transferable skills, including customer service, merchandising, teamwork and communications. The program incorporates both self-paced, computer-based learning and mentoring from a supervisor. Besides helping associates apply what they’ve learned through the online modules, supervisors are able to provide frequent feedback and check-ins as the training progresses and to engage associates in discussions on job performance and potential career opportunities. Educational opportunities. Since 2010, Walmart has broadened its view of how it can help associates succeed in retail careers. Through the Lifelong Learning initiative, 7,185 associates have enrolled in our high school programs and 74,000 associates have enrolled to use Rosetta Stone to learn languages since 2014. Another 8,500 associates have started college since 2011. In FY2017, more than 1,700 scholarships were awarded to associates and their dependents through funding from the Walmart Foundation. Training for managers. We also continue to build out our Academy training program. 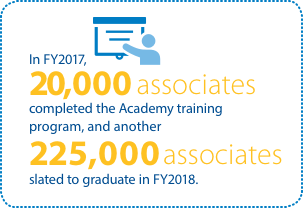 In FY2017, Walmart opened 60 academies. The academies are dedicated facilities that offer two to six weeks of hands–on, immersive learning, combining both classroom study and training on the sales floor. The academies prepare associates for jobs as frontline hourly supervisors, department managers and assistant managers, teaching them to read spreadsheets, profit and loss statements and other skills necessary to take on greater responsibility. We expect to have 200 academies in place by the end of FY2018 each of which will serve some 25 nearby stores. When I was a student at the University of Indiana, my Walmart job was simply a way of paying bills. After graduation, I was encouraged by my store managers to stay, as they saw promise in me. Thirteen years later, I’m still here. So I fully understand the opportunity that exists to start a career. Today I’m a co-manager at a supercenter in Beech Grove, Indiana, and it’s awesome to watch others take that same journey. One young woman I recently crossed paths with—Kinder Kaur—is the most passionate associate I’ve ever met. Recently she worked her way up to managing an entire department. Rewind this story back to 2006. Kinder was a first-generation immigrant from India here with her husband and son trying to make a better life. She worked in an audiovisual business that her husband owned and also as a restaurant server for two and a half years. Next, she got experience in retail as she worked in their family-owned convenience store. Wanting a change, Kinder decided to come to Walmart. She started in our back room, unloading and stocking inventory. It’s hard work, but Kinder excelled. Her attention to detail made her stand out. Seeing this, I thought she would be a good candidate to try something new: being out on the floor. While she was nervous, with a little support from her team she was ready. Fast-forward to last fall, and Kinder was shining. She loves being out on the floor interacting with customers, and her sharp eye really matters in the beauty department, where smaller items like nail polish and hair dye need to be meticulously organized. Not too long ago, our store manager encouraged all of us to apply to enter the company’s new Academy program, where associates can receive extra training that better equips them to help customers. Kinder was a natural candidate, and after completing the program, she participated in her first graduation. In Kinder’s native India, graduation ceremonies aren’t common. Although she completed high school, she had never worn a cap and gown. Putting on these pieces was an extremely proud moment for Kinder and her family. Her son, Gurpreet, who works in electronics at Walmart, also graduated with his mother. It was awesome to see such a great day of celebration for their family! Everyone I see return from the Academies training is more excited and attentive than before. 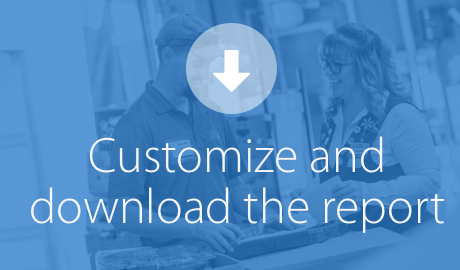 They’ve returned with a fresh mindset about how to take care of customers. These Academy locations are opening nationwide, and soon there will be thousands of associates who’ve graduated. The Academies program is empowering associates across the country to take charge of their careers. But even better, it’s harnessing the passion of people like Kinder, which is a huge step forward in also transforming our shopping experience. 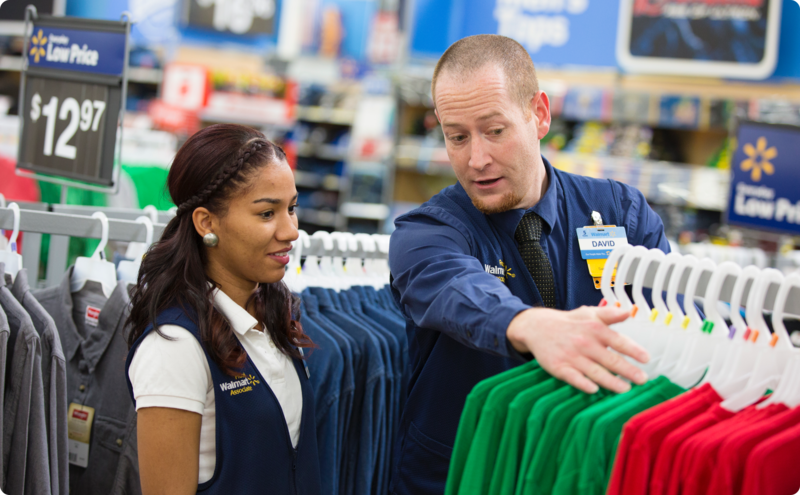 At Walmart, we mean it when we say that a frontline retail job can be the first step in a rewarding career. Wellington Marinho, district director of Sam’s Club in Brazil, is a great example. Marinho joined Walmart Brazil in 1998 as store cashier. Over the next 18 years, he was promoted through positions such as goods operator, cashier controller, auditor, training coordinator, support manager and store manager. In 2009, Marinho was promoted to district director of Sam’s Club and today leads a team of 230 store associates. Core job skills. The Walmart Foundation invested in the human development nonprofit FHI 360 to launch a campaign in Baltimore and Chicago promoting the value of the core job skills frontline retail workers hone—skills like teamwork, customer service and problem solving. The program is aimed at employers in retail and beyond, as well as the workers themselves and is designed to increase the mobility of workers who have developed core job skills. Impact of retail employment. The Walmart Foundation also funded a report by Opportunity Nation that shows there is a correlation between increases in a state’s economic prosperity, a composite measure based on factors including rates of poverty, crime and income equality. Retention of entry-level employees. 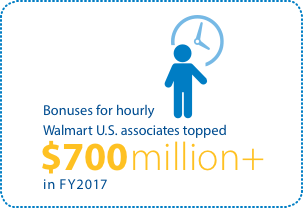 In FY2017, Walmart made a grant to FSG to research and identify strategies and best practices for retaining young, entry-level employees, especially those who are out of school and not working. With additional Walmart funding, FSG will publish a report and conduct additional research on pre-hire interventions that could improve retention of entry-level employees. FSG’s research is now being applied by the 100,000 Opportunities Initiative, as that project seeks to increase hiring and support of opportunity youth. Retail training beyond the U.S. Supporting talented graduates in South Africa. Massmart, our South Africa business unit, runs two programs aimed at preparing young people for careers in retail. The year-long Graduate Development Programme (GDP) provides young, talented graduates with both classroom training and practical, on-the-job experience. Our program graduates earn an accredited post-graduate diploma in Business Management, which further aids them in their retail careers. Massmart also runs a Store Operations Development Programme (SODP) aimed at providing practical and theoretical training for future store managers. Both programs are focused on providing development opportunities to women and previously disadvantaged young people. Since their inception in 2007, these programs have supported almost 400 graduates across our various Massmart divisions. In 2015, almost 70 percent of graduates found permanent jobs within Massmart. Seiyu supports Sodateage.net, a certified non-profit organization with a strong track record in employment support for young people who are unemployed, and not in education or vocational training. In an effort to promote social inclusion and economic empowerment for these youths, Sodateage.net and Seiyu created a program called “Seiyu Pack” providing young people job training and in-store training at Seiyu stores. In FY2017, 25 youths were trained. 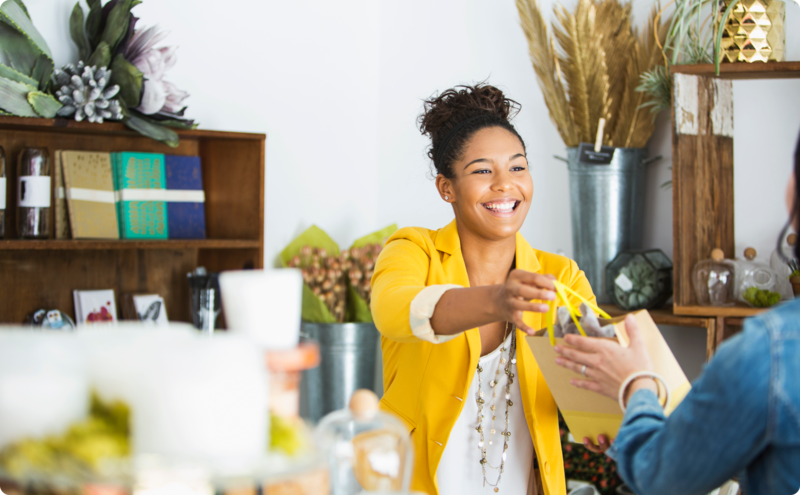 We believe that entry-level retail jobs, which are widely accessible, can be a first step up the career ladder—but only if they are accompanied by effective training and credentials that are recognized throughout the sector and beyond. Innovate new approaches to training. To date, Walmart and the Walmart Foundation have provided funding for the training of over 8,000 prospective and current retail workers—supporting innovative and new approaches to training that we believe are crucial for enhancing economic mobility of workers. For example, according to a report from Brookings Institution, one in 10 working-age adults in the U.S. is held back from advancing to better-paid jobs by limited language skills. In FY2017, the Walmart Foundation made a grant of more than $1.8 million to the National Immigration Forum (NIF) to support the development of a scalable English-language learning program that can be used throughout the sector for frontline workers. To date, 17 percent of participants have been promoted after just 12 weeks of training, and 80 percent have improved their English proficiency—compared to the 2007 national average of 39 percent for adults enrolled in ESL courses. Support workforce investment boards. We are also encouraging workforce development organizations that have strong track records of placing and advancing workers to focus more deliberately on the retail sector. For example, the Walmart Foundation’s $10.9 million grant to the Chicago Cook Workforce Partnership, one of the nation’s largest Workforce Investment Boards (WIBs), distributed 10 re-grants to leading WIBs across the U.S. to design career pathways for retail. To date, the participating WIBs have provided retail training and support services to over 28,000 prospective and current retail workers. The Northwest Indiana WIB even opened a Retail Training Lab in a local mall so that job seekers can take classes that cover the interpersonal and technical skills necessary to create an overall outstanding customer experience. Develop and share best practices. We believe that workforce development can happen faster when organizations and employers have a way to learn from one another. Walmart is a founding member of 100,000 Opportunities Corporate Coalition, a group of more than 40 employers committed to developing and spreading hiring practices that lead to better outcomes for youth who are out of school and seeking to enter the workforce. Building on this experience, Walmart and Rockefeller Foundation funded FSG to create a community of companies interested in identifying best practices and proving the business case for hiring and developing individuals who may face barriers to economic opportunity. Improve worker assessment, training and evaluation. In Dallas, Walmart has funded Innovate+Educate (I+E), an initiative aimed at helping employers improve the way they assess, train, and evaluate workers. Specifically, I+E is working with Workforce Solutions Greater Dallas (the Workforce Investment Board for Dallas County), community colleges, NGOs and employers to assess front-line workers and provide training that increases the opportunities for advancement. Participating employers will track candidates to measure the effectiveness of the program. Walmart employs more than 2.3 million associates in thousands of communities around the world. We are, by definition, a diverse organization. We believe that it is our people, in all their diversity, and our culture that helps Walmart to be successful. 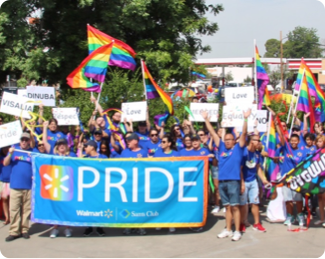 Creating a culture that fosters diversity and inclusion is fundamental to everything we do at Walmart. What do we mean by that? First, our culture is how we live out our values in the workplace. Second, diversity refers to the unique styles, experiences, identities, ideas and opinions that make our associates who they are. And third, inclusion results when we create a workplace in which all associates feel welcome and comfortable. An inclusive culture helps associates around the world experience the full potential and opportunity available at Walmart. In a truly inclusive workplace, associates are engaged and able to perform at their best. As a result, they provide better service to our customers and members by creating a clean, fast and friendly shopping experience. By fostering a workplace culture where everyone is— and feels—included, everyone wins. Walmart’s Global Office of Culture, Diversity & Inclusion (CDI) aligns our diversity and inclusion programming with our broader efforts to modernize the corporate culture. Our goal is to create a Walmart culture that is consistent around the world and results in a global workplace in which everyone is included. We do this by infusing aspects of diversity and inclusion into our training on Walmart values and behaviors, and by ensuring that our CDI principles are a part of every facet of the associate life cycle—from recruiting and hire through development, promotion and retirement. We’re using scorecards and next-generation metrics such as culture and inclusion indices to help measure our progress and inform future priorities. In early FY2017, we created the President’s Inclusion Council, chaired by our president and CEO Doug McMillon, which comprises a diverse group of 17 leaders from our business segments around the world. The mission is to advise and collaborate with our CEO and other senior leaders in efforts to build an inclusive environment. The group is charged with finding the best solution for the company while learning and benchmarking against external best practices in diversity and inclusion. Walmart seeks to hire and develop talented people who represent the perspectives and interests of our global customers. We are excited that women and people of color (see right) represent a greater proportion of leadership at Walmart than the Fortune 500 average—but we are not satisfied. As competition within the retail sector continues to increase, we are focused on recruiting and retaining the best people we can—and that means redoubling our efforts to foster diversity. With the right training and development and an inclusive environment, we believe we can build a diverse pipeline of talent that is committed to helping our customers live a better life around the world. Walmart established seven Associate Resource Groups (ARGs) in 2005 that help enrich cultural awareness, increase engagement in the local diverse communities we serve and build a greater sense of community and connection among diverse associates at Walmart. They are also a strong development tool for our diverse talent and a significant channel for driving change and impact across the enterprise. We offer a variety of classes, training sessions and presentations across the organization to help associates at all levels create an inclusive culture. Examples include a session with actor and gender advocate Geena Davis on the power of inclusion as part of the Bentonville Film Festival and in-depth presentations by leading external experts on recognizing and mitigating unconscious bias. Just as diversity and inclusion build stronger and more vibrant organizations, we believe those same elements contribute to stronger communities. Only by coming together can we solve the complex issues facing our communities, and indeed the world. At Walmart, we believe this underscores the need for a movement toward inclusion. 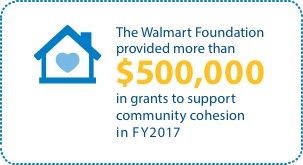 The Walmart Foundation provided more than $500,000 in grants to support community cohesion in FY2017. If an enemy is trying to get to you, there’s a way he or she won’t get through…Laugh. That’s a line from one of my poems—I’ve been writing inspirational poetry most of my life. I’ve tried to live by the truth in those words ever since I was a young child who loved to ride bikes and dreamed of growing up to be a football player. When I was five years old I was confronted with a very real and dangerous enemy—a brain tumor that was pressing on my optic nerve. Doctors successfully removed the tumor—likely saving my life. When I woke up from the surgery, however, it was to a world of blindness. That tumor might have gotten to my sight but it didn’t get to my spirit, and it hasn’t stopped me from dreaming. I still get to ride bikes. I live out in the country where I can ride freely. And I shifted from a dream of playing football to the reality of playing baseball. Beep baseball, that is. In beep baseball we use a ball that beeps so you know where and when to swing and where to track to catch. We also have beeping bases so you know where to run and throw. I play outfield and I’m pretty good, and so is my team the Tyler Tigers. In fact we’ve traveled to places like Georgia and Minnesota for the beep baseball championships. Today I’m working on a new dream: to grow in my career at Walmart. About 3 years ago I started in a training program with Goodwill. The training included an on-the-job assignment in the produce department at Walmart. After proving myself in the Goodwill program, Walmart hired me as a permanent associate. I celebrated my one-year anniversary in February, and now I work in the dairy department. I used Braille labels on signs when I first started so I’d know where everything was supposed to go. Now I’ve learned my department so well, I don’t even need the signage. If a customer asks me where to find the butter or milk, I can take her right to it. I like working for Walmart. They helped me find a place where I could fit. The thing I like most is helping my fellow associates get used to working with a person with a disability. The next step is to work with department managers and other leaders in my store to determine what I need to learn in order to pursue more growth opportunities with Walmart. I tell everybody that I look at each day as a challenge. I’m ready to take that challenge head on because I want more for myself and for those who come behind me. I want to leave a legacy that other people with disabilities can follow. Inclusion is just as important in our supply chains and the communities in which we operate as it is in our own organization. We believe that retail and its supply chain can be the start of a career that helps lift individuals and families to a higher economic level. For example, in the U.S., we focus our efforts on supporting our military men and women as they transition to civilian life. In emerging markets, we support women in different parts of the supply chain, from farm to factory to store. Founder Sam Walton was fresh out of the army (where he served as a captain in WWII) when he opened his first store. Walmart has always welcomed U.S. veterans into our workforce; it’s part of our history. 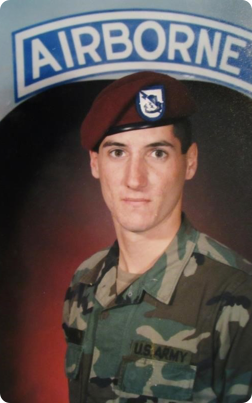 We know firsthand the value veterans bring to our business and to our communities. To aid in the transition to civilian life, Walmart made a commitment in 2013 to offer a job to any eligible, honorably discharged U.S. veteran within 12 months of active duty. We expanded that commitment in 2015 to include any veteran discharged since Memorial Day 2013, and set a goal to hire 250,000 veterans by the end of 2020. To strengthen our support of veterans as they reintegrate into their local communities, Walmart and the Walmart Foundation committed to investing $20 million over five years beginning in 2011 in job training, education and innovative public-private community-based initiatives. After fulfilling the $20 million commitment a year early, Walmart and the Walmart Foundation announced an additional $20 million investment through 2019 for a total of $40 million over a nine-year period. Our investments help veterans navigate the wide array of resources available to them to smooth the transition. Hiring veterans as Walmart associates. Veterans bring skills that are of enormous value in our operations. Since Memorial Day 2013, Walmart has offered jobs to more than 162,000 U.S. veterans and has promoted more than 20,000 veterans to roles of greater responsibility. 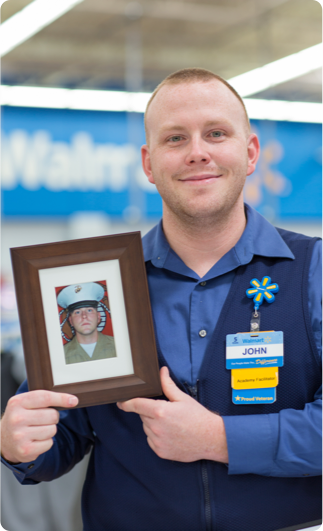 We also support our veterans and their families through Walmart’s Military Family Promise, which guarantees a job at a nearby store or club for all military personnel and military spouses employed at Walmart and Sam’s Club locations who are transferred to a different part of the country by the U.S. military. In addition, when our associates are called away to active military duty, Walmart promises to pay any difference in their salary if their military assignment pays less. Reintegrating veterans into local communities. One of the challenges returning veterans face is having to navigate a complex web of resources in job placement, housing, healthcare, education and training. We support organizations that help streamline and improve access to these resources, especially in military-connected communities in California, the Carolinas and Texas. Walmart and The Walmart Foundation work closely with many veteran and military family organizations, and two that received funding from the Foundation in FY2017 for support of their collective-impact work are the Institute for Veterans and Military Families (IVMF) and Mission Edge: zero8hundred. IVMF has focused on using technology to bring organizations serving veterans into streamlined care networks, providing a single gateway to resources. Since going live in January 2015, IVMF AmericaServes networks have connected more than 4,700 service members, veterans and families to available community resources. 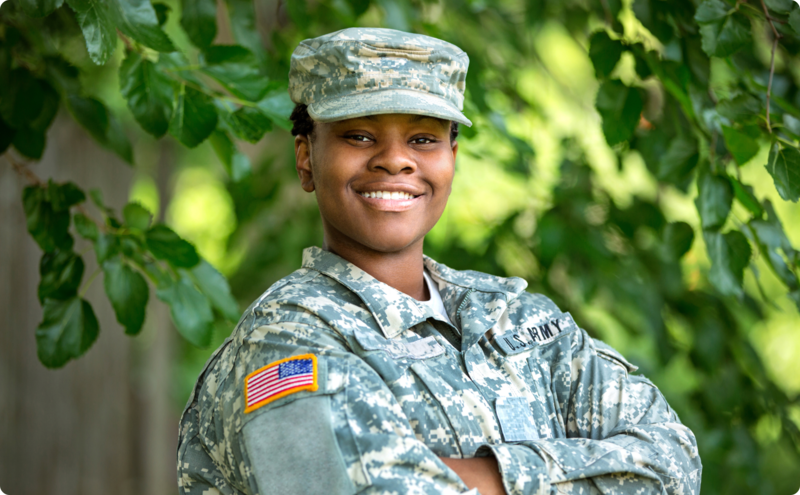 San Diego based z8h connects transitioning service members and their families to a broad range of resources within their community and expects to face increased demand over the next two years. Supporting veterans as entrepreneurs. As founding members of the Coalition for Veteran Owned Business, Walmart and Sam’s Club are committed to helping the organization grow and support veteran-owned businesses in communities throughout the U.S. The coalition connects these businesses with education and training, small business resources and solutions, and commercial and supplier opportunities. 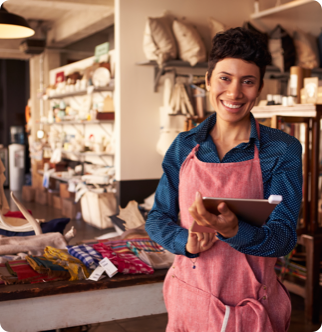 According to the Census Bureau, there are currently more than 2.5 million veteran-owned small businesses in the U.S., which generate $1.2 trillion in annual sales and employ more than 5.8 million Americans. Engaging the public in supporting veterans. In FY2017, Walmart celebrated the second year of Greenlight a Vet, a campaign to help create national recognition for American veterans. Associates, customers and community members replaced an ordinary light in their home or business with one that was green as a way to show support for veterans and then recorded this effort on GreenLightAVet.com. Walmart continues to support veterans and military families during the holiday season with support for two organizations, Wreaths Across America and Operation Homefront. Walmart associates joined thousands of people on National Wreath Laying Day in December to lay wreaths on the graves of veterans. And, between Thanksgiving and Christmas Walmart supported Operation Homefront’s Holiday Meals for the Military helping put a meal on the table of 8500 military families in 26 locations across the country. 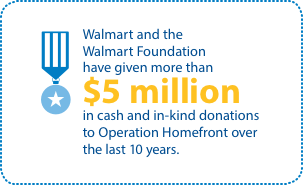 Over the past 10 years, Walmart and the Walmart Foundation have given more than $5 million in cash and in-kind donations to Operation Homefront for various programs. Women play a crucial role in retail supply chains around the world, as well as in the economic wellbeing of families and communities. In agriculture alone, women are responsible for 43 percent of farm production in low- and middle-income countries, and in China they make up 60 percent of the workers who migrate from rural areas to work in city factories. Women who earn an income typically invest 90 percent of it back into their families and their communities, breaking the cycle of poverty. Yet around the world, women’s average earnings are almost half of men. In 2017, Walmart and the Walmart Foundation will complete a five-year commitment with funding in place to train 1 million women around the world with the aim of improving their market access and enhancing their career opportunities. This work was done through the Walmart Global Women’s Economic Empowerment Initiative (WEE). 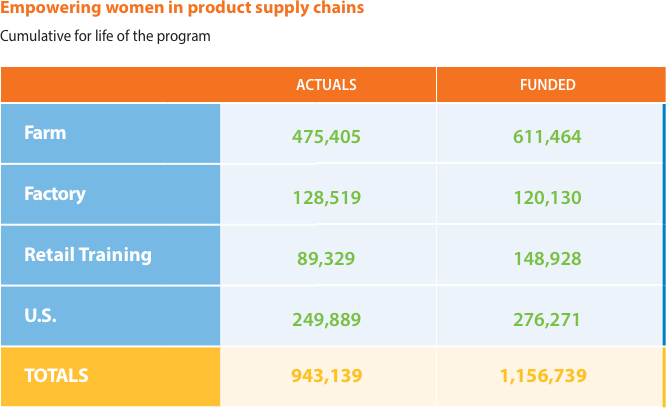 The training components focus on women in four parts of the global supply chain: farms, factories, retail in emerging markets and low-income women in the U.S. The goal is to help women enhance their incomes and build their confidence as leaders in their workplaces, families and communities, while increasing factory and agricultural productivity. With funding in place to complete our goal of training over 1 million women, we expect to exceed our goals in three out of our four focus areas. While we have not completed training for women in retail in emerging markets, we will continue this work over the coming years. Women in agriculture. Women farm workers in low- and middle-income countries are a vital link in our global supply chain. Walmart and the Walmart Foundation have now funded training projects for more than 500,000 women smallholder farmers through the end of 2016. For example, a grant to One Acre Fund is expected to help improve livelihoods for 50,000 farmers in Western Kenya, 32,000 of whom are women, through hands-on agricultural training and improved utilization of farm inputs. Women in factories. In 2011, we launched the Women in Factories Training Program. The goal of this five-year initiative was to train 60,000 women in factories and processing facilities that produce goods for top retail suppliers and to develop a curriculum that could be adapted to a variety of cultural contexts. The program, which was implemented in collaboration with local NGOs, trained the women in skills that help them become more active decision makers, both on the job and in their home lives. The training program has been implemented in 181 factories in Bangladesh, China, El Salvador, Honduras and India, and delivered training to 128,710 women. The curriculum, available on the Walmart corporate website, was designed to be “open source” so that others can use it to provide training. The Women in Factories program is being evaluated by experts from Tufts University. Women in retail in global markets. Because we believe that the retail sector can be a powerful force for economic mobility around the world, training for entry-level retail jobs in emerging markets has been an important part of the WEE training effort. As of the end of 2016, we have put funding in place to train 149,428 of the 200,000 we committed to train in 2011. In China, for example, the Walmart Foundation supported the China Chain Store & Franchise Association (CCFA) to prepare women for working in the food retail sector. Progress on this goal has been slower relative to other parts of the WEE program because the retail sector in emerging markets is less developed in terms of organized retail, and the training landscape is fragmented. For the past eight years, Walmart Canada has prioritized gender diversity, focusing on the development of female associates through its Women in Retail program. Since the inception of the program, Walmart Canada has seen a positive increase in the percentage of female store managers—from 15.5 percent at the end of 2009, to 23.6 percent by the end of FY2017—an increase of 52 percent. The success of the program in Canada has led to its rollout to other Walmart international markets. Women in entry-level U.S. jobs. We have also supported pre-employment training for low-income women in the U.S., funding support for more than 276,000 women to gain job skills and prepare for employment. With the completion of this part of the WEE training goal, we continue to support economic opportunity for women in retail in the U.S. through our Retail Opportunity program. Through that program, we hope to help women working in the frontlines of retail advance at similar rates to their male peers. We continue to support economic opportunity for women in retail in the U.S. through our Retail Opportunity programs. be “open source” so that others can use it to provide training. The Women in Factories program is being evaluated by experts from Tufts University. Women in retail in global markets. Because we believe that the retail sector can be a powerful force for economic mobility around the world, training for entry-level retail jobs in emerging markets has been an important part of the WEE training effort. As of the end of 2016, Walmart and the Walmart Foundation have put funding in place to train 148,928 of the 200,000 we committed to train in 2011. In China, for example, the Walmart Foundation supported the China Chain Store & Franchise Association (CCFA) to prepare women for working in the food retail sector. Progress on this goal has been slower relative to other parts of the WEE program because the retail sector in emerging markets is less developed in terms of organized retail, and the training landscape is fragmented. 52 percent. The success of the program in Canada has led to its rollout to other Walmart international markets. 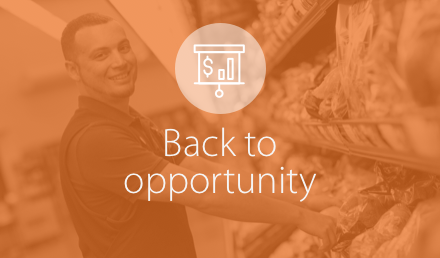 in the U.S. through our Retail Opportunity program (see pg. 16). Through that program, we hope to help women working in the front lines of retail advance at similar rates to their male peers. 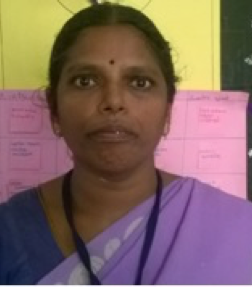 Devi hails from Karur, India, and works as a trimmer at Asian Fabricx, Karur. She lives with her husband and two children and, until recently, was the sole breadwinner in the family, as her husband did not work. Devi struggled to make ends meet. She was unhappy and felt powerless. She never questioned her husband and feared asking him to find a job, as it would lead to fights. She lacked the confidence to speak to people, and would not answer even if someone asked her a question. That started to change when Devi attended the advanced training at her factory under the Women in Factories program. She says it was a turning point in her life, especially the second module on “Bridging the Future.” The session on communication taught her to be assertive and improve her communication skills. She shared the learnings from the program with her husband and children after each session. One day, Devi decided to speak to her husband. She explained her struggle to meet the family’s expenses on her own and motivated him to go to work. What happened next changed her life. Her husband found a job, and has started going to work regularly. He also helps her with the chores at home. Devi taught her children to prepare a timetable for studying, and ways to control their anger, as they would lose their tempers even for the smallest reasons. She also shared learnings on menstrual hygiene with her daughter.